Boosting the ranks of working women in Japan could raise the country's GDP. Japan is squandering one of its most precious resources. Not its world-famous fisheries or tech savvy. Rather, Japan is failing to tap the potential of its women -- a demographic that could hold the key to an economic turnaround. Japan has been battling deflation for years, and its economic woes have been aggravated by a shrinking workforce -- the result of a rapidly aging population and a slowing birth rate. At the same time, the country is home to millions of highly educated women that are not working. Women are "a very obvious hidden asset," said Kathy Matsui of Goldman Sachs, who has researched the role of women in Japan for over a decade. "It's hard to run a marathon with just one leg." 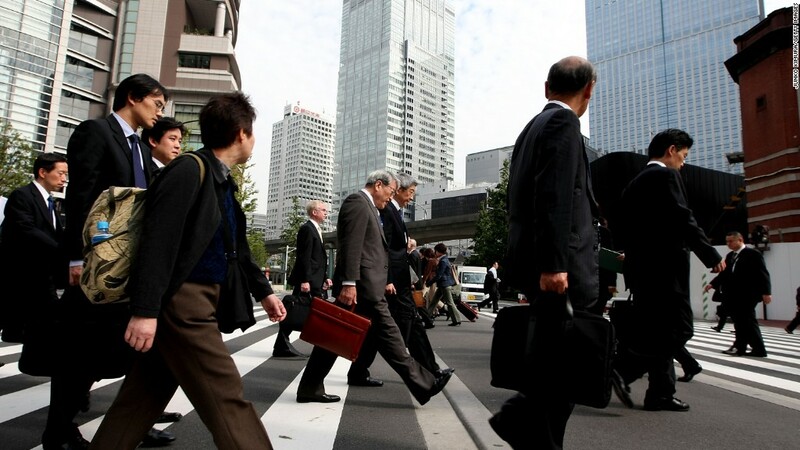 Japan's female employment rate is currently around 60%, far below the 80% rate for men. If that rate were to rise even a few points, the added productivity would go a long way toward boosting Japan's growth potential. Japanese women already tend to buy more than the country's men, and more working women would mean increased disposable income and spending. It's a problem the country's top policymakers are looking to correct. Prime Minister Shinzo Abe said in April that Japan's women are its most underutilized resource, and set specific targets to raise female labor participation. Those goals are part of Abenomics, a strategy that includes a mix of government spending, central bank stimulus and structural reforms designed to promote growth. Abe said women must hold at least 30% of senior positions in all parts of society by 2020, and companies should appoint at least one female as an executive. Another goal is to increase the female labor participation rate by 5% for women aged 25 to 44. Other reforms would support family needs, such as expanding child daycare capacity and extending maternity leave from one to three years. Setting targets might not be enough to ensure change. Right now, about 70% of Japanese women quit working after giving birth to their first child, partly because the economic incentives just aren't there. Men are paid 28% more than women in Japan, a rate that has improved over recent decades, but remains significantly higher than other developed countries including France, Sweden and the U.S.
Changing tax policies could go a long way to help, said HSBC economist Izumi Devalier. A family can currently only deduct a second income if it remains under about $10,000 a year -- a hurdle for spouses who wish to work more. "But pushing them into full-time work doesn't do the trick either," Devalier said. "You need to have an entire support system that encourages them to lead a lifestyle where you can have a child and still work." Matsui said that Japan must also change its cultural mindset, which often still favors men as breadwinners and women as homemakers. According to an IMF working paper, gender bias may make it more difficult to place women in top political or corporate positions in Japan. The number of women in the upper ranks are thin. In 2009, about 9% of Japan's managers were women, compared to 43% in the U.S.
Abe himself has broken with tradition, appointing two women to posts in his 18-member cabinet. Major companies such as Daiwa Securities and Shiseido have also promoted women or set targets to raise the number of female managers. Still, real progress could take years. "[Japan has] got a huge, massive opportunity staring at it in its face," Matsui said. "Do you ignore it? Or do you try and embrace that opportunity?"